Live Chat software is an offline customer service web service to live support, help desk software with web analytics capabilities. It is commonly used to provide immediate support and information to clients and customers allowing them to interact with businesses through real-time live support. Using Live Chat for customer service can be rewarding and on the contrary be a huge hassle if used unwisely. Where is Live Chat used? Live chat is the quickest methods of customer service; hence there has been an increasing number of companies using the software. Irrespective of the industry, variant businesses are using different channels and products to provide quickest, most accessible and simplest form of support. Live chat is used across various verticals in their daily operations. To name a few are, e-commerce, travel & hospitality, medical professionals, automotive, airlines, education, real estate, web hosting companies and many more. Few features of Live Chat Software. Proactive Support: It is a feature for customer support software where operators initiate chat with visitors by offering an instant help. This may come with a custom message on a small live chat window. Offline mode: It’s a mode that can be used when all agents are either offline or away. Chat monitoring: It lets record detailed conversations in real time and also tracks who among your agents are in assistance with your customers. This helps improve efficiency and productivity. Integration: Live chat can be integrated with some of the CRM software solutions like Salesforce, Assistly and more. This way, one can save the customers conversations on the customers’ existing profile in Salesforce. File transfers: Having an efficient and convenient file transfer built-in tool can be a significant advantage. Reports and analysis: This is a tool used to monitor significant data such as chat history, operator activities, visitor details, conversion tracking and more. Benefits of Live Chat Software. Live chat is a must have a tool in any business and can positively impact your business. 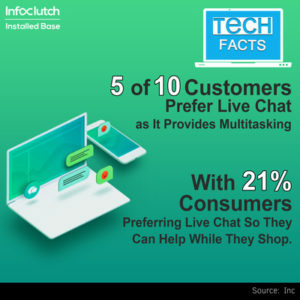 Live Chat increases sales and conversions: It is the vital component of any marketing strategy that builds trust, enhance customer experience and generates greater ROI which in turn increases sales and conversions. Reduces expenses: In contract to phone service which is costly in terms of both toll charges and person per hour costs, live chat support is a lot cheaper. It also enables agents to multi-task and assist several visitors at once. Improves website experience: Satisfied long-term customers are less likely to switch. With Live Chat, customers have the flexibility to do what they are doing and also chat with the support agent. It is also found that customers who use live chat are 3 times more likely to make a purchase. Boost customer loyalty and service: Live Chat makes it easier for customers to get in touch with the brand or the company. It fosters a sense of trust and confidence by providing a direct way for customers to ask questions or having sales rep guide them. Expands market reach: Just by having a website, one cannot expect orders from customers. It is highly necessary to have a chat option where customers can make inquiries and purchases by directly contacting you any time and from anywhere.